By Bo Stewart, Harrison Stewart, and Zack Quaintance — There are an increasing number of startup and independent publishers in comics. So many, in fact, that it can sometimes be hard to keep up with all the great books they’re putting out. Vault Comics, TKO Studios, AfterShock Comics, Ahoy…the list goes on and on. To that end, today we’re launching a new feature called Meet the Publisher. Now let’s get to our interview with Mark! Check out our other Mad Cave Studios features! Mad Cave Studios CEO/CCO Mark London. Q: So, let’s start with the basics...who are you folks, where are you from, and how long have you been making comics? Mad Cave Studios is an independent publisher based in Miami, Florida. We’ve been hard at work since 2014, focused on creating unique, visually-stunning comics across multiple genres that captivate a wide audience. We want our #CaveDwellers not to passively read our comics, but enjoy taking a deep, introspective journey with our characters, environments, and themes. Yes, it may be profound, but it is who we are. You see, the company’s name, Mad Cave Studios, stems from the fact that we harness madness to create uniquely compelling and diverse comic books. We strive to produce quality books, so the reader can expect the best possible products. Q: What inspired you to start making and publishing your own comics? For me, it’s all about storytelling. I grew up in the ’80s, a helluva time to be exposed to all sorts of media: Comics, video games, movies, animation, literature; all great platforms for storytelling in their own way. I devoured everything I could get my hands on, but comics have always been dear to me. There is something about sequential art that really connects with me and mesmerizes me at the same time. To some, they are just pictures divided into grids, into panels, into pages, but for me, they’re so much more. So, I guess it was just a matter of time before I put my fascination with storytelling to good use and I chose comics as the medium. Q: If you had to give an elevator pitch for your brand, how would you describe the comics that Mad Cave makes? Mad Cave delivers fun, action-packed comics across a variety of genres. It’s Mad Cave’s obsession. World building stories. The hero's journey. Feel good comics. Those are the kinds of stories that I read, saw or interacted with when I was growing up and wanted to write my own versions of, the Mad Cave way. Q: A somewhat sizable (or at least vocal) segment of our audience consists of aspiring comics writers, and I’m sure they’d like me to ask if Mad Cave has plans to eventually publish work by other writers…. Not at the moment, unfortunately. There are certain stories we are planning to tell in the immediate future. But that could change soon, who knows. Mad Cave’s initial releases of comics are written by me. Since we were starting a publishing /content building company and the writer is also the CEO, things tend to get a little crazy. If you look at Valiant’s inception back in the ’90s, Jim Shooter was writing those books. The Image founders were all writing and drawing their own books, Joe Pruett did the same thing for AfterShock with one of their launch titles (B.E.K. ), Pizzolo at Black Mask…I could go on and on. So, since we are past that brutal first phase, and the company has grown substantially, it was a no brainer to acknowledge that we needed more hands on board. Hence the talent search. I’m happy to report that it was a success and we have some very talented artists and writers joining the ranks. I can't wait to show the world all of the new and interesting titles they’ve been working on, but all I can say is that the books, as well as the talent themselves, have heart, they are full of passion, and they are a blast to read. Q: Can you describe the journey of starting out in comics publishing? Brutal. It's like eating glass haha. Some might say that there is no right or wrong way to make comics, but in reality, there is. And there are the rules you painfully learn as you go through the learning process. So, yeah, too many missteps to talk about in this interview, but that’s how you get better at something, right? I’m a firm believer that you learn more from your mistakes than from your achievements. Of course, the idea is to improve on those mistakes and never make them again. And if they do happen, just keep pushing forward and never look back. Q: How difficult is it these days to get the attention of folks who read creator-owned comics and what have you found most useful in doing that? Word of mouth is critical for the success of your book. You have to go to conventions in order to spread the word, to speak with as many retailers as possible so you can get your books into their stores and therefore reach fans. Have a website and join the different social media channels, so that you can engage with people who want to make comics or enjoy reading them. Q: Where should an interested reader start if they’re interested in getting into Mad Cave’s comics? The best way is at www.madavestudios.com and on social media including Facebook on Facebook.com/MadCaveStudios and @MadCaveStudios on Instagram and Twitter. As far as where you should start reading, Battlecats was our launch title and it is coming back for a second volume in May. There is also cyberpunk, noir thriller, Midnight Task Force. We also have Knights of the Golden Sun, a book that has really done well for us. That story is the original tale of good versus evil. Angels and demons. And our newest series, Honor and Curse, follows a young shinobi haunted by the spirits of his past. Q: What advice do you have for someone interested in publishing comics, or really just getting into the industry? Make sure that you love it. Pay attention to the whole industry, not just the comics. Learn the comics craft inside out. Practice as much as you can. Write, show it to friends and family, accept the good, the bad, and the ugly. Then rinse and repeat. There is no middle ground with comics and the learning curve is very steep. Like my wife likes to keep reminding me: “This is not a sprint, it's a marathon.” So keep pushing forward no matter what and if you stick through it long enough, then you have a shot. And never forget why you started making comics in the first place. 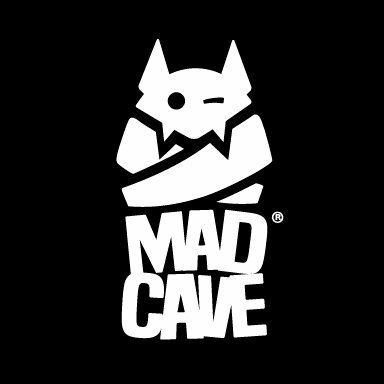 Q: What does the immediate future hold for Mad Cave? Comics, comics, and more comics. We are content builders and we have an aggressive strategy for the next three years that we strongly believe will benefit fans of all genres. Mad stories with mad twists are coming your way from writers and artists that love the medium, love the industry, and are giving it their best so that fans everywhere can have the best time reading comics. Harrison Stewart is an aspiring human being whose goals include solving the mathematical equation for love. Follow him on Twitter for more writing stuff. Sign up for exclusive content through our weekly newsletter!